At first, I was reluctant to do this service since I was pretty doubtful about attendance. 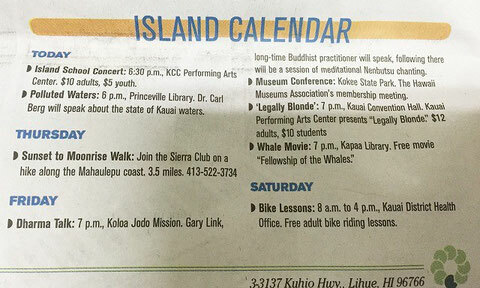 Also I didn't know if the Garden Island Paper could publish our service on the paper. But now I can believe people will come! and I have to thank Rev. Shinri and the Garden Island Paper for this publication. Arigato gozaimasu!!! So far I received two phone calls about a location of our temple. Also, Claudia, my Dharma friend in North Carolina kindly sent email notice to the Jodoshu google group in the world. I'm sure some will join us through the livestreaming video. So I'm not afraid anymore about attendance. Rev. Shinri told me, "Without try, how can you get a good result?" She was right. I thought I was always a challenger however I realized there should be always more to challenge! Also I remember a simple saying by the movie Forrest Gump. 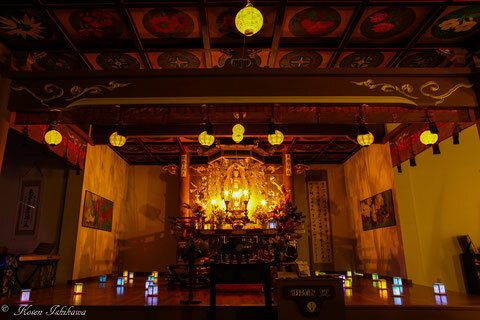 Evening Dharma Talk and Buddhist Meditational Chanting at Koloa Jodo Mission on Friday, April 22 at 7:00 p.m. All are welcome! Thank you to Reverend Shinri Hara for persuading you to try! We enjoyed watching the live streaming service. uddha Recitation the oral form is the most powerful practice. If ones mind only focuses on recitation, that itself is the main practice itself. When the mind is only focusing on recitation, it has no time to break precepts. When reciting orally, the mind turn inward to "see" the recitation and hear the sound of recitation at the same time.